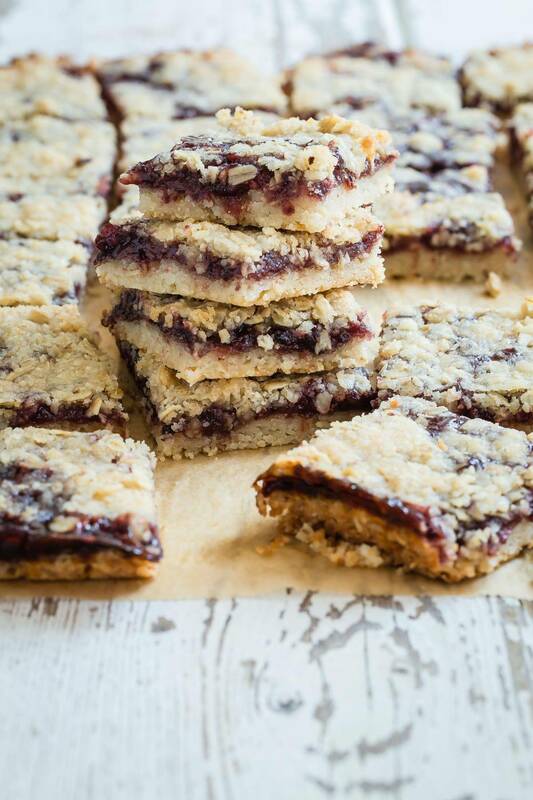 These Jam Crumb Bars are loaded with butter, two kinds of jam and rolled oats! They’re so easy to make but so hard to just eat one square. If these Jam Crumb Bars came with a warning. It would read something like this. “Eating one square of these here jam crumb bars may lead to inhaling more or all of said jam crumb bars”. They’re really really good and just one of the recipes from my friend Philia Kelnhofer’s new book, Fast and Easy Five Ingredient Recipes. Phi writes for her blog Sweetphi.com so she knows her food. I know we live in a time where you can pull up a recipe on a computer, tablet or even your phone but there’s something about an actual real paper version of a cook book that makes me excited to flick through it. Maybe that’s why I have so many! My father-in-law has a room in his house that is the home to hundreds of books and I always wondered why, but now I know because I’d totally do the same for my cook books. I look to them for inspiration when my brain dries up or for styling ideas when I’m shooting that blah brown burger. Phi’s book is the perfect concept for someone who wants to cook an awesome meal but might be tight on time. Each recipe requires only five ingredients but she still manages to pull off recipes like, Chicken Feta Tomato Pasta and Chocolate Peanut Butter Swirl Fudge! I can see this book being one that never quite makes it back into the proper place on the shelf You know the one because you just keep using it and it gets covered in grease spots and hard pieces of dough and all the edges are curled up? Yeah, a few of my favorite books are just like that. I was provided with a copy of Fast and Easy Five Ingredient Recipes to review. All text and opinions are my own. 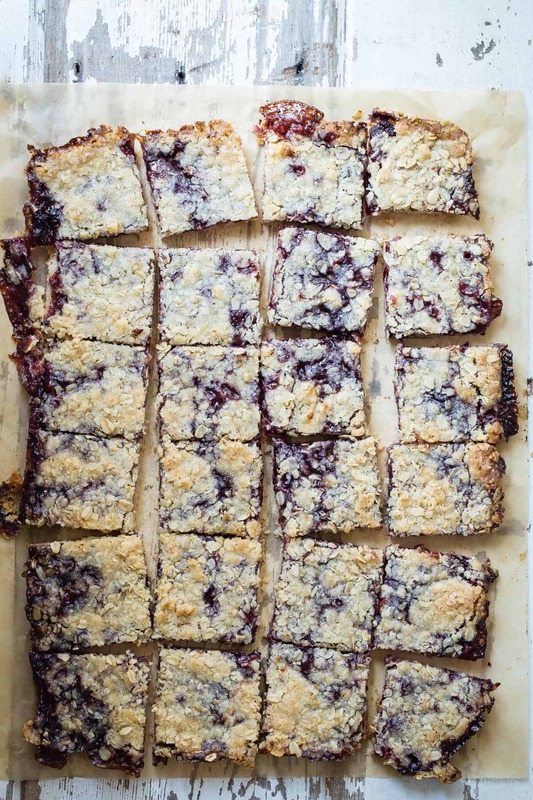 Sweet and buttery, these Jam Crumb Bars are perfect for pot luck's and backyard summer barbecues. Or you could just eat them all yourself! Line a 10x15x1 inch deep baking pan with parchment paper. Cut two sticks of the butter into pieces and add to a food processor with 1 2/3 cups of the flour, 2/3 cups of sugar and 1/3 cup of the rolled oats. Pulse on high speed for about 15 seconds. Dump the mixture into the prepared pan and press down with a flat bottomed container or your hand. 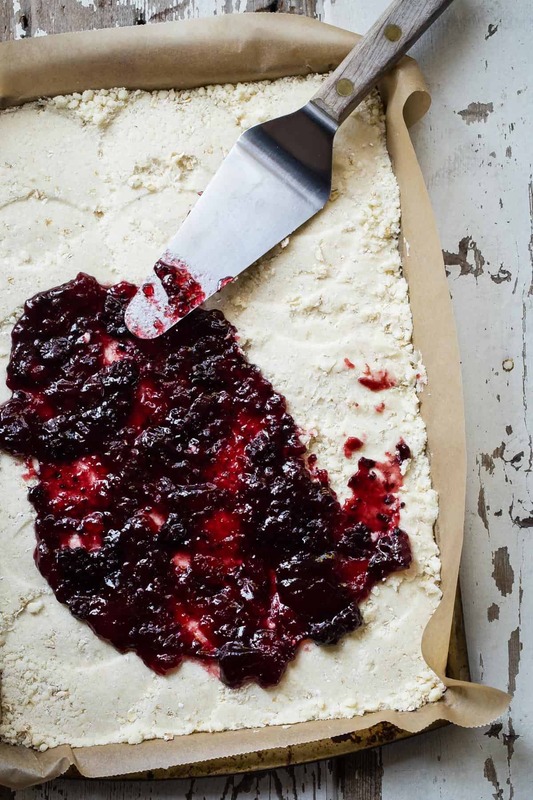 Spread the jam carefully and evenly over the pastry. Chop the remaining stick of butter and add to the food processor along with 1/3 cup flour, 1/3 cup sugar and 2/3 cups of the oats. Pulse on high speed for about 10-15 seconds. Sprinkle the crumble mixture on top of the jam. Bake in the oven for 25-30 minutes and then let cool for at least 1 hour before slicing into squares. I just got my mitts on Phi’s book!! Adding this to my must-make list! Get those mitts in the kitchen! Three sticks of butter = music to my ears! Ooo – I need to check out Phi’s book pronto! I want to inhale all of the crumb bars while flicking through it! Do it Sarah, these bars were awesome!! Wow wow wow! 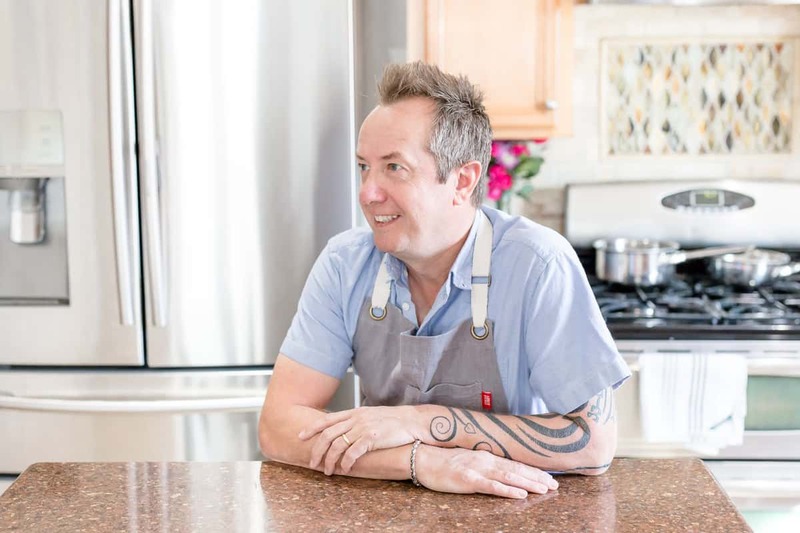 I am truly speechless, THANK YOU so much for sharing about my cookbook and the kind words and incredible photos- I am truly touched and so appreciative! 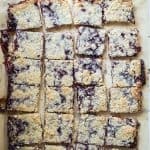 I’m beyond happy you enjoyed the jam crumb bars (a total favorite for summertime with my friends and family) and I loved the warning you wrote. Thank you again! Those bars look amazing Gerry! I’ve never met a crumb bar I haven’t liked! These look killer! Oh I know all too well how you feel about cookbooks! And well,any books. I do the same! In internet everything looks the same,but in a book I could find it with my eyes closed. Well, probably :) Thank you for the tip! I will stock up on Philia’s cookbook! The bars look amazing! And so do the pictures! I am going to give this a try subbing coconut oil for the butter. I’ll let you know how it turns out. I mean, even if we have to eat it with a spoon it will likely still be delicious! Welp! It was a failed attempt due to the fact that I don’t own a food processor. The crumble got overworked in the kitchen aid. I knew immediately I had made a huge mistake! I’ve learned my lesson! You cant sub a food processor for a mixer. Better luck next time for me! Great recipe, though!